A manometer allows you to determine the pressure of a gas sample by using the atmospheric pressure and difference in the height of mercury. In an open end U-tube manometer there are two forces acting on the mercury: the outside atmospheric pressure and the pressure of the gas inside the manometer. Given a barometric pressure of 755.5 mmHg , calculate the pressure of gas sample (a) as indicated by the manometer. Given a barometric pressure of 755.5 mmHg , calculate the pressure of gas sample (b) as indicated by the manometer. Given a barometric pressure of 745.5 mmHg , calculate the pressure of gas sample (a) as indicated by the manometer. Given a barometric pressure of 745.5 mmHg , calculate the pressure of gas sample (b) as indicated by the manometer. If the atmospheric pressure is 0.980 atm , what is the pressure of the enclosed gas in each of the three cases depicted in the drawing ?What is the pressure of the enclosed gas in (i)? Assume that the gray liquid is mercury. If the atmospheric pressure is 0.980 atm , what is the pressure of the enclosed gas in each of the three cases depicted in the drawing ?What is the pressure of the enclosed gas in (ii)? Assume that the gray liquid is mercury. If the atmospheric pressure is 0.980 atm , what is the pressure of the enclosed gas in each of the three cases depicted in the drawing ?What is the pressure of the enclosed gas in (iii)? Assume that the gray liquid is mercury. 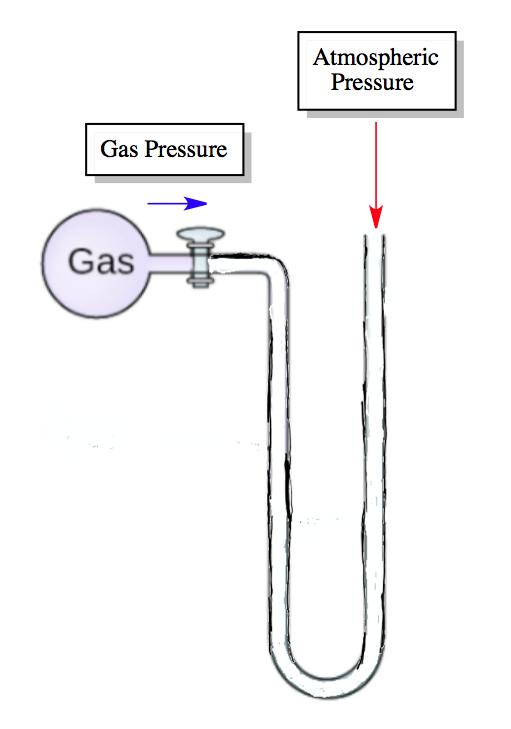 An open-end manometer containing mercury is connected to a container of gas, as depicted in Sample Exercise 10.2 in the textbook. What is the pressure of the enclosed gas in torr in each of the following situations?The mercury in the arm attached to the gas is 12 mm lower than in the one open to the atmosphere; atmospheric pressure is 0.96 atm . Suppose that a liquid is 12 times denser than water.If you were to sip this liquid at sea level using a straw, what would be the maximum length of the straw? You may want to reference (Pages 397 - 400)Section 10.2 while completing this problem.What would be the height of the column in a barometer if the external pressure was 101 kPa and water (d = 1.00 g/cm3) was used in place of mercury (height of the column = 0.760 m)? A mercury barometer.What happens to h the height of the mercury column, if the atmospheric pressure increases? A barometer tube is 1.00×102 cm long and has a cross-sectional area of 1.20 cm 2. The height of the mercury column is 74.0 cm, and the temperature is 24°C. A small amount of N2 is introduced into the evacuated space above the mercury, which causes the mercury level to drop to a height of 64.0 cm. How many grams of N2 were introduced? What is a manometer? How does it measure the pressure of a sample of gas? A sealed-tube manometer (as shown below) can be used to measure pressures below atmospheric pressure. The tube above the mercury is evacuated. When there is a vacuum in the flask, the mercury levels in both arms of the U-tube are equal. If a gaseous sample is introduced into the flask, the mercury levels are different. The difference h is a measure of the pressure of the gas inside the flask. If h is equal to 6.5 cm, calculate the pressure in the flask in torr, pascals, and atmospheres.If the sealed-tube manometer above had a height difference of 20.0 inches between the mercury levels, what is the pressure in the flask in torr and atmospheres? A diagram for an open-tube manometer is shown below.If the flask is open to the atmosphere, the mercury levels are equal. For each of the following situations where a gas is contained in the flask, calculate the pressure in the flask in torr, atmospheres, and pascals.a. A diagram for an open-tube manometer is shown below.If the flask is open to the atmosphere, the mercury levels are equal. For each of the following situations where a gas is contained in the flask, calculate the pressure in the flask in torr, atmospheres, and pascals.b. A diagram for an open-tube manometer is shown below.If the flask is open to the atmosphere, the mercury levels are equal. For each of the following situations where a gas is contained in the flask, calculate the pressure in the flask in torr, atmospheres, and pascals.Calculate the pressures in the flask if the atmospheric pressure is 635 torr. A diagram for an open-tube manometer is shown below.If the flask is open to the atmosphere, the mercury levels are equal. For each of the following situations where a gas is contained in the flask, calculate the pressure in the flask in torr, atmospheres, and pascals.a. If the open-tube manometer in contains a nonvolatile silicone oil (density = 1.30 g/cm3) instead of mercury (density = 13.6 g/cm3), what are the pressures in the flask in torr, atmospheres, and pascals? On a cool, rainy day, the barometric pressure is 730 mmHg. Calculate the barometric pressure in centimeters of water (cmH2O) (d of Hg = 13.5 g/mL; d of H2O = 1.00 g/mL). A long glass tube, sealed at one end, has an inner diameter of 10.0 mm. The tube is filled with water and inverted into a pail of water. If the atmospheric pressure is 755 mmHg, how high (in mmH2O) is the column of water in the tube ( d of Hg = 13.5 g/mL; d of H2O = 1.00 g/mL)? How would the use of a volatile liquid affect the measurement of a gas using open-ended manometers vs. closed-end manometers? In Figure P5.10, what is the pressure of the gas in the flask (in atm) if the barometer reads 738.5 torr? In Figure P5.11, what is the pressure of the gas in the flask (in kPa) if the barometer reads 765.2 mmHg? If the sample flask in Figure P5.12 is open to the air, what is the atmospheric pressure (in atm)? In Figure P5.13, what is the pressure (in Pa) of the gas in the flask? A diagram for an open-tube manometer is shown below.If the flask is open to the atmosphere, the mercury levels are equal. For each of the following situations where a gas is contained in the flask, calculate the pressure in the flask in torr, atmospheres, and pascals.If the open-tube manometer in contains a nonvolatile silicone oil (density = 1.30 g/cm3) instead of mercury (density = 13.6 g/cm3), what are the pressures in the flask in torr, atmospheres, and pascals? Why is it necessary to use a nonvolatile liquid in a barometer or manometer? An open-end manometer containing mercury is connected to a container of gas, as depicted in Sample Exercise 10.2 in the textbook. What is the pressure of the enclosed gas in torr in each of the following situations?The mercury in the arm attached to the gas is 15.2 cm higher than in the one open to the atmosphere; atmospheric pressure is 0.985 atm . A sealed-tube manometer (as shown below) can be used to measure pressures below atmospheric pressure. The tubeabove the mercury is evacuated. When there is a vacuum in the flask, the mercury levels in both arms of the U-tube are equal. If a gaseous sample is introduced into the flask, the mercury levels are different. The difference h is a measure of the pressure of the gas inside the flask. If h is equal to 6.5 cm, calculate the pressure in the flask in torr, pascals, and atmospheres. b. What advantage would there be in using a less dense fluid than mercury in a manometer used to measure relatively small differences in pressure?